A cop buddy movie that benefits enormously from one of the most eccentric and memorable police officers created for the screen. Los Angeles Detective Martin Riggs (Mel Gibson) is depressed, suicidal, utterly unpredictable, and a deadly former military sharp shooter. In the hands of screenwriter Shane Black and director Richard Donner, Riggs is also somehow real. Edgy, unconventional and dangerous, but never straying into ridiculous territory. The film rides smoothly in Riggs' slipstream, as he and straight-laced, 50-year-old partner Detective Roger Murtaugh (Danny Glover) set their sights on breaking up a ruthless drug cartel. Glover as Murtaugh, a middle-aged family man comfortably settled in the suburbs, is the perfect antithesis and foil for Gibson's Riggs. The baddest of the bad guys is the menacing Gary Busey as the terrifically named Mr. Joshua. 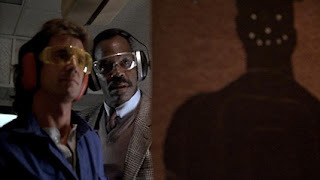 Also formerly in the military, he is in charge of removing any threats to the drug-running cartel, and soon this means eliminating Riggs and Murtaugh -- or going after the latter's family, which proves easier. The film does not shy away from a gritty side, with Mr. Joshua and his goons torturing Riggs, and a fairly vicious but unnecessary final martial arts duel between the two. Lethal Weapon cannot fully escape the relatively narrow constraints of the genre, and creaks due to some shallowness in the secondary acting talent. But the movie mixes good action with a streak of mean humour, and maintains a reasonable pace that allows the stars to shine and safeguards against whiplash. There is a smoothness and assuredness to the movie that comes from Gibson, Glover and Busey perfectly fitting into their characters, and Donner directing briskly and with an eye to respecting the characters and maximizing the advantage of having such a strong cast. Credit also to Shane Black, who, at 23 years of age, wrote a fearless script that created a franchise and consolidated Gibson's star status. Lethal Weapon spawned three direct sequels and numerous imitators, and set the standard for cop buddy movies. It was often imitated, but rarely equaled or bettered.